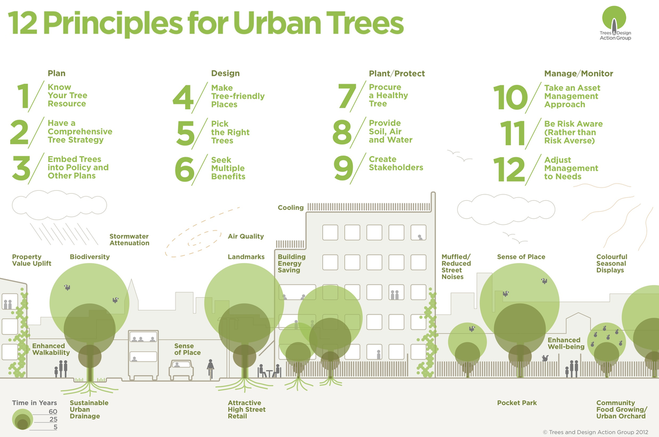 12 principles of best practice for all those involved in local decision making to ensure that our 21st century towns and cities are underpinned by a 21st century approach to urban trees, for maximum economic, social and environmental returns. Each principle is supported by explanations of benefits and delivery mechanisms, as well as references for further reading. Trees in the Townscape: A Guide for Decision Makers received the 2016 Landscape Institute Award for Policy and Research. Explores the practical challenges and solutions to integrating trees in 21st century streets, civic spaces and surface car parks, detailing process, design and technical options. Will be of particular interest to highway engineers, public realm professionals and tree specialists. in both the public and private sectors to increase awareness of the role of trees in the built environment.